The Secret of Abraham Lincoln’s Success as a Writer? Rosemarie Ostler is a linguist and former librarian, Her books about slang and word origins explore the colorful turns of phrase in America's past lexicon. Her articles have appeared in The Saturday Evening Post, Whole Earth, Christian Science Monitor, Verbatim, Writer's Digest, and Entrepreneur.com among others. 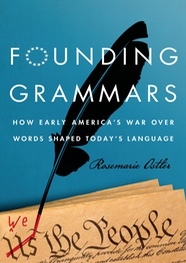 Her latest book is “Founding Grammars: How Early America's War Over Words Shaped Today's Language” (May 2015). Abraham Lincoln’s formal education was remarkably sparse for a man who later became president. By his own estimate, his schooldays amounted to less than a year altogether, and these were passed in poorly equipped frontier classrooms. He wrote dismissively in his autobiography of the “schools, so called,” where the teachers were barely qualified, and anyone in the neighborhood rumored to know Latin “was looked upon as a wizard.” Yet Lincoln is remembered today as one of our most eloquent presidents. His best-known speeches are still familiar and cherished. Lincoln developed his linguistic skills partly by following a once-common early American tradition—self-betterment through grammar study. Grammar books were the self-help manuals of the early republic. Cheaper and more available than other books, they were frequently the only classroom texts in small rural schoolhouses. They were also the only secular books in many homes. For people too poor or too isolated to attend school, mastering a grammar primer was the first step toward economic and social success. Grammar study was thought to sharpen the mind and prepare people for further education, as well as leading to a better command of elegant speech. As with thousands of other nineteenth-century Americans, the young Abe’s self-education and rise out of poverty started with basic textbooks. These included English schoolmaster Thomas Dilworth’s New Guide to the English Tongue and fellow countryman Noah Webster’s Grammatical Institute. Like most other popular grammar books, these titles were first published in the eighteenth century and had gone through numerous editions by Lincoln’s day. Dilworth was available in nearly all classrooms, even in remote places like rural Indiana, and secondhand copies of both books were fairly easy to find. Lincoln would have learned parts of speech and basic sentence structure from these books. 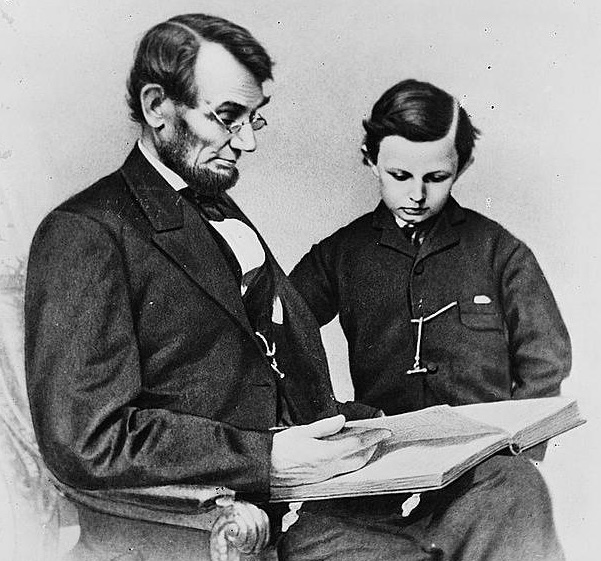 The adolescent Lincoln also studied elocution books, including one owned by his stepmother—William Scott’s Lessons in Elocution. This volume would have introduced Lincoln to the standardizing rules that all eighteenth-century grammar books emphasized. Among the “common errors” that Scott discusses are ending a sentence with a preposition (Who did you give it to? ), following a preposition with a subject pronoun (between you and I), and following the verb to be with an object pronoun (It was him.) Scott also offers a section on literary devices like antithesis. When Lincoln began contemplating the possibility of a law degree, he took up grammar study at a higher level, making an effort to seek out the most respected authors. Learning that a local farmer owned a copy of schoolteacher Samuel Kirkham’s popular English Grammar in Familiar Lectures, he walked several miles to borrow it. From another friend he borrowed a copy of the best-selling grammar book of the time, English Grammar, Adapted to the Different Classes of Learners by American expatriate Lindley Murray. Typically for that time, Lincoln mastered the books by memorizing them. He would have started at the beginning, with definitions—“A noun is the name of any person, place, or thing.” Then he would have progressed to more complex rules—“The verb to be, through all its variations, has the same case after it as that which next precedes it.” He would have learned such niceties as the various ways to use shall—including for determination and insistence—and the proper usage of the subjunctive mood. Murray’s book also provided more sophisticated compositional advice in the form of style rules. Here Lincoln would have read, for instance, about the value of a “plain, native” style over highly ornamented prose. The critics’ attacks weren’t really about Lincoln’s speaking style. In the nineteenth century, “bad grammar” was a code that suggested a whole range of other deficits. Saying that Lincoln couldn’t use language correctly implied that he was of humble origins and therefore unworthy of the highest office in the land. Newspaper readers of the time would have gotten the message. Contrary to what his enemies claimed, Lincoln’s speeches were carefully constructed. They show that he thoroughly grasped the grammar rules found in the books he had studied. For example, his Cooper Union speech of February 27, 1860 features the use of nominative case after the verb to be (“It was not we, but you, who discarded the old policy of the fathers”). Lincoln also used the present subjunctive unless you be rather than unless you are (“Your purpose, then, plainly stated, is that you will destroy the Government, unless you be allowed to construe … the Constitution as you please”), and correctly placed prepositions before their objects (“I give [the Democrats] … all other living men … among whom to search”). The Gettysburg address, delivered on November 19, 1863, includes the specialized use of shall with third person to promise or express determination (“Government of the people, for the people, by the people shall not perish from the earth”). The emphatic use of shall had been on the wane since the late eighteenth century. By the 1860s it would have been uncommon outside of grammar books, yet Lincoln obviously understood how to use it effectively. None of the formal grammar rules that Lincoln applied in his speeches could have been acquired naturally from the people around him while he was growing up. He learned them by studying grammar. Grammar books promised to set users like our sixteenth president on the path to scholarly and social achievement. In this case at least, that promise was fulfilled.